This one won’t last. New floorings + fresh paint at the Aquarius II by Concord Pacific in Yaletown – Excellent floor plan with one bedroom plus den. Floor to ceiling with views of the city & mountains. Open plan living room. Beautiful, with all the features you’re looking for. Granite counters, gas stove, den big enough for a guest room. Amenities include fitness centre, swimming pool, rooftop gardens and concierge service. 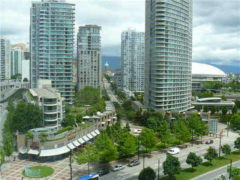 Seawall, Urban Fare, restaurants and the Canada Line are just steps away! Good for first time buyer or investor. Rental income $1900 per month. All Furniture is included in the price.